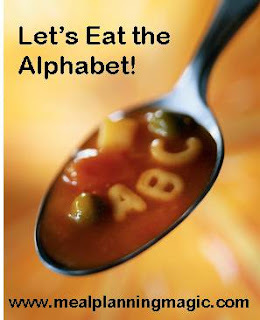 It's time once again for the Eating the Alphabet Challenge. This month we had to chose a fruit, vegetable, grain, bean, or legume that began with the letter K or L.
K and L are pretty easy letters to work with. Kale, kiwi, kumquat, lettuce, lime, lemon. Lots of choices. 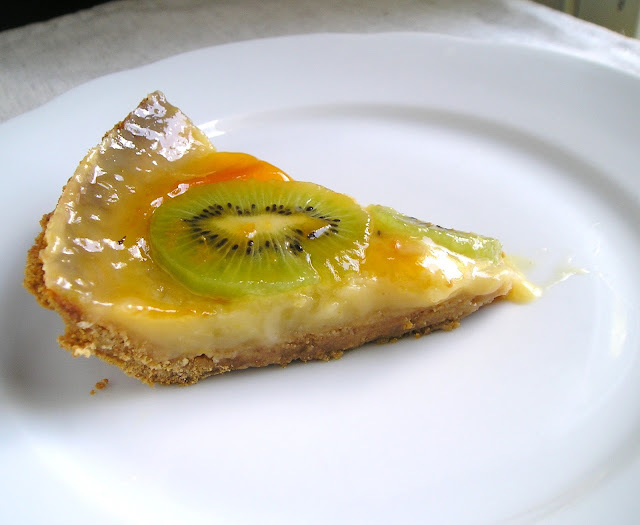 I decided on a recipe that used both of the assigned letters, K and L. I made a pie with kiwi and lemon. I found the recipe at RecipeLand. Here's my adaptation. Heat milk over low heat in top of double boiler over simmering water. Combine sugar, cornstarch, and egg yolks in a medium bowl. Add a small amount of the warm milk, stirring constantly. Add another small amount of milk to the sugar/egg mixture, stirring until combined. Gradually add the sugar/egg mixture into the warm milk, stirring constantly. Increase heat to a boil, then lower heat and cook 5 minutes, or until mixture thickens. Whisk in lemon juice, zest, and vanilla. Pour mixture into pie shell. Bake for 25 to 30 minutes or until center is set. Cool pie for 10 minutes. Melt preserves in the microwave and brush thin layer over surface of pie. Arrange kiwis to cover top of pie. Brush again with remaining preserves and cool in the refrigerator for at least 1 hour or longer. As you can see in the picture above, my pie turned out less-than-perfect, which is a nice way of saying "kind of messed up!" I did kind of mess it up. But it wasn't the recipe's fault, it was mine. Well, the first problem I had was that it called for the juice of 3 lemons. Well, the lemons I had were total monsters. They were about twice the size of a normal lemon, which you can see above. So I had to do some research to see how much juice to use. The second problem I had was that I ran out of cornstarch. I needed three tbsp and only had about two. I tried to compensate for this by removing some of the milk. It kind of worked. I had to cook the pie a lot longer than stated to get it to set up. And well, there were some other complications, but I won't bore you with the details! In the end, while it wasn't the prettiest looking thing, it tasted good, so that's all that matters! I took too long taking pics and the filling started to ooze out on me. So yeah, I had some problems, but it ended up working out. My husband loved it so much he said he wanted to stick his face in it. That makes it a success in my book! Problems or not, that is a great pie combination and I bet it was really tasty. require a massive amount work? I've virtually no expertise in coding but I had been hoping to start my own blog in the near future. 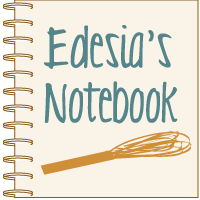 Anyways, if you have any ideas or tips for new blog owners please share. I understand this is off topic however I simply had to ask. Kudos!